Harrisburg, PA – In support of his mission to create a government that works, Governor Tom Wolf announced that his 2016-2017 Budget proposal will include two mergers to save money and better serve shared missions: the merger of the Board of Probation and Parole with the Department of Corrections and moving the eHealth Partnership Authority to the Department of Human Services, which combined will immediately save more than $11 million. He also announced that since its creation a year ago, the Governor’s Office of Transformation, Innovation, Management and Efficiency (GO-TIME) has laid the groundwork and is well on its way to achieving $150 million in savings. The merger of Probation and Parole and Corrections will create the new Department of Corrections and Rehabilitation to ensure public safety and the successful transition of offenders back into the community. This merger will save more than $10 million right off the bat when the budgets and operations are combined. The 2016-17 Budget proposes to move the eHealth Partnership Authority to the Department of Human Services to realize administrative savings and maximize federal dollars. Moving current personnel to the department would save approximately $1 million annually, in addition to improving operations and timeliness. To date, GO-TIME has identified nearly 250 initiatives by state agencies to modernize government operations by increasing efficiency, improving technology and identifying opportunities for agencies to collaborate and share resources. These initiatives will provide benefits including savings, reduced processing times, increased convenience and maximizing existing resources. Improving Procurement Strategies. The Department of General Services (DGS) will save a projected $100 million in 2015-16 by re-examining existing contracts, applying commercial best practices and reintroducing reverse auctioning to procurement. Transforming Data Centers. The Office of Administration is pursuing financial and operational benefits through data center consolidation. Current initiatives are raising the bar through increased flexibility for IT capacity aligned with business demand. Consolidating Mailrooms and Services. DGS has begun to consolidate outgoing mail services for a number of agencies, generating savings from presorting, volume discounts, reductions in staffing and equipment and repurposing space previously used for mail activities. With all agencies onboarded for service, presorting of outgoing mail is saving taxpayers more than $34,000 per week. Sharing Electronic Grants Solution. For years, agencies have leveraged manual or outdated systems to administer their grant programs, resulting in inefficient and lengthy processes. Agencies soon will be able to leverage the Department of Community and Economic Development’s electronic grants application rather than invest time and resources to develop custom applications. Innovative Financing for Energy Savings. DGS is exploring opportunities to install energy conservation measures in commonwealth-owned buildings and pay for them with future savings from reduced energy consumption. Online Voter Registration. This new portal allows eligible citizens to register to vote online and update information such as name, address or party affiliation, providing added convenience for citizens, greater engagement in the democratic process, as well as improved data accuracy and reduced costs for counties. Regionalizing State Prison Purchasing. By consolidating the purchasing of food and other items for smaller facilities, the Department of Corrections (DOC) has been able to improve operational efficiencies and timeliness for purchases, which will save an estimated $1.5 million this fiscal year. Reducing Inmate Medical Costs. Following a comprehensive review of off-site trips for inmate medical treatment, the DOC identified several services that could be performed on-site or at nearby correctional facilities, reducing transportation costs. The department is also using its status as a covered entity under the Public Health Service Act to obtain HIV and Hepatitis C drugs at reduced prices. • Increasing Mobile Technology in the Field. As a result of the savings and efficiencies that PennDOT has gained by developing mobile applications for inspectors working in the field, the Department of Environmental Protection is looking to double the productivity of its inspectors working to protect our air, soil and water by utilizing this technology. The Department of Agriculture will increase efficiency and communications through the use of mobile technology and cloud storage. Using Technology to Improve Public Safety. Prior to this year’s record-breaking snowstorm, PennDOT outfitted over 700 of its plow trucks with vehicle location software in order to respond more quickly to changing conditions and reduce salt usage, saving an expected $1.4 million over the next four to six years. The public can also monitor plow truck locations using the state’s traveler information website. In the coming year, GO-TIME intends to focus on continuous process improvement to maximize efficiency, establishing external partnerships to bring new ideas into government and continuing to engage employees in driving transformation. 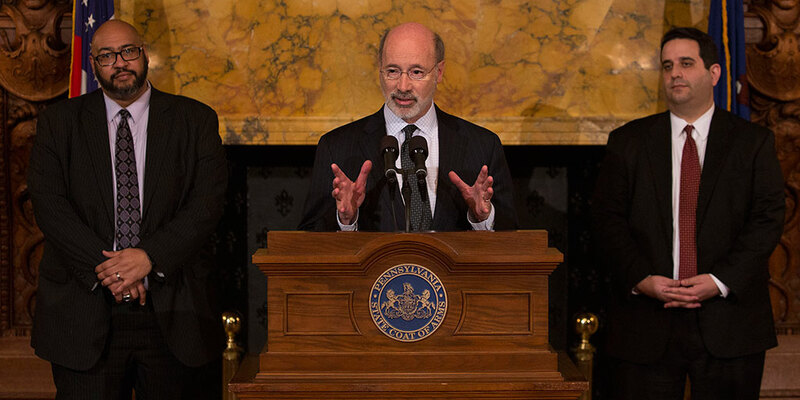 Read more posts about Governor Wolf’s 2016-17 budget.